Lea will make her debut at the prestigious Carnegie Hall's Isaac Stern Auditorium, the premier classical music performance space in the United States, in New York City on Monday, November 7th, 2005. Performing one night only, Salonga's concert will be an intimate show with a mix of show tunes, jazz standards and other popular favorites. Excited about her first solo concert at Carnegie Hall. Richard Jay-Alexander has directed & produced Bernadette Peters's Carnegie Hall concerts Live at Carnegie Hall and Loves Rodgers and Hammerstein, and the concert tours of Bette Midler's Kiss My Brass and Barbra Streisand's Timeless Farewell, will direct Salonga's Carnegie Hall debut. He was associated with theater impresario Cameron Mackintosh for a long time, having served as Executive Director of Mackintosh's American company for ten years, running its day-to-day operations in North America. He was both Associate Director and Executive Producer of Mackintosh's original Broadway, touring and Canadian productions of Les Miserables, The Phantom of the Opera, Miss Saigon and Five Guys Named Moe. Jay-Alexander was the Executive Producer of Five Guys Named Moe’s Grammy-nominated original cast recording. He also produced the Grammy-nominated recordings of Bernadette Peters's Live from Carnegie Hall and Loves Rodgers and Hammerstein. US ASIANS: In addition to hearing great Broadway, jazz, and pop songs -- including "Orange Colored Sky," "Someone Else's Story," and "On My Own" – will there be any special surprises that one could expect in your very short tour (i.e. snippets of her memorable times both in the U.S. & Philippines through song, guest stars, clips from your wedding, special stage presentations, unique music presentation with a small jazz combo without the entire symphony that allows the audience to participate in an intimate experience of enjoying all the subtle nuances of your voice that would otherwise not be heard, tributes to OPM legends/U.S theater productions, etc.) – especially since you’ve always stated that "I want the exercise of doing something new!" The (2005) tour represents, perhaps, Salonga's fourth attempt to achieve the stardom that has proved frustratingly elusive to Asians in America. Her fans might argue she's already been there, done that. But as she sips her soup and spins out the story of her life here in L.A., it's hard to see in this pretty, 34-year-old woman as anything but another struggling actress. "I want to get out there and say: This is the face of an Asian entertainer in America. I would like to be known as someone who is able to transcend racial boundaries. LEA SALONGA: I'll be performing a couple of Tagalog songs, something that I always do in shows abroad... I'm also doing some newly arranged songs that I loved in some recent concerts performed in Manila... and some other cool songs that I just like to sing. No huge surprise though, you won't be seeing me on a flying trapeze or anything. US ASIANS: With many musicians interested in the lush orchestration that will be heard from many of the songs that will be heard, did you have any input into the arrangements that will accompany your performances? LEA SALONGA: My brother arranged much of the material. Whatever he did, he tried out on me first before committing it to paper and making more full orchestrations. I didn't have a lot of input though, besides "make it sound good." I'll have a 6-piece band accompanying me, not a full orchestra. US ASIANS: Will there be special instruments brought along (i.e. Eleanor Academia/Kulintang Institute, drums, percussion, etc.) to enhance the night’s performance? LEA SALONGA: Nope, just a band. US ASIANS: Are there any special significance in the current venues (February 12 at the Nob Hill Masonic Center in San Francisco, February 19 at Boardwalk Hall in Atlantic City, February 26 at the Arie Crown Theater in Chicago and March 5 at the Universal Amphitheater? LEA SALONGA: You'd have to ask the producer that question. He chose the dates and venues. There's no special significance for me. US ASIANS: Is this upcoming tour focus to celebrate with your Filipino/Asian audiences the pride you have with your culture and/or is it geared towards the American audience that have known you through your many appearances/performances within the U.S. media? LEA SALONGA: Both. I'm hoping that it'll elevate my visibility level here in the US, while at the same time bring the Asian audiences to see it. In San Francisco, there was large Filipino presence in the audience, so one thing was achieved there. Let's see if the other will be. Only time will tell, I guess. US ASIANS: Remembering that you’ve stated "I look forward to being back on stage, just me and a band of musicians making some good music the old fashion way. It's as intimate a show as it can get" – what three words would describe to audiences what they will be experiencing when they see you perform? LEA SALONGA: A... good... time. Ms. Salonga provided additional tangible evidence that her skills and artistry can overcome any and all obstacles during this night of musical enchantment. The above-listed band provided an adequate replacement to the expected Gerard Salonga-led orchestra and performed well the wide spectrum of songs American and Filipino songs that were sung to the adoring fans that were in attendance. The situation that occurred that night provide Lea opportunities to display her ability to established an "up close and personal" rapport with the audience. 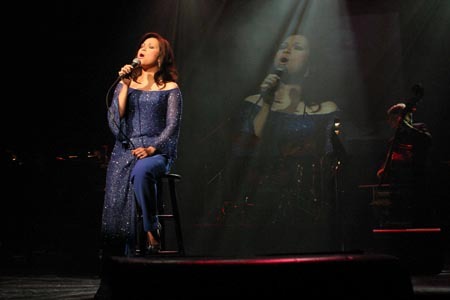 Lea's vocal talents were in full display during her performance of various "torch songs" that exhibit the full timbre of her chest voice that provided her the power to fully expressed the various song's sentiments. Despite the less-than-perfect concert settings, one was still enchanted and mesmerized by the vocal magic that Lea always brings - just like any other true artist and performer that brings memories of Liza Minelli/Judy Garland/Bette Midler/etc. OLD SCHOOL SINGERS: Old-school singers really take care of the words that they're singing," said Salonga, who counts Nat King Cole and Ella Fitzgerald among her favorite vocalists. "You understand, not just enunciation-wise, but really get the feeling of the words. Not everything is about vocal calisthenics. It's more about the emotions behind the words, rather than impressing everyone with the octaves you can reach." SELECTION OF MUSICAL THEATER ROLES: I'm interested in just about anything that's right for my voice, and that's a good fit for my personality in the part as well. Evita has always been a dream part for me, but it's really, really high to sing. I'd LOVE to do Elphaba, heck – I'd even do Glinda. For me, I'd do anything to get into Wicked! I'll do either one, I just want to be in that show! Also, if they ever revive Les Miserables, I'd love to do Fantine since I've done Epinone. I'd like to play the other dead girl!" 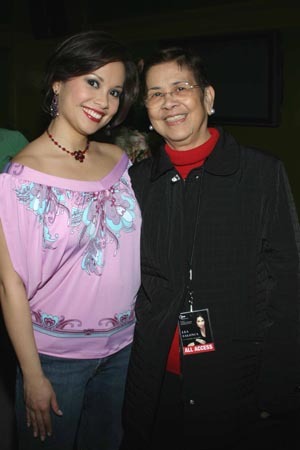 LOVE OF MUSICAL THEATER: But Salonga, whose magnificent voice can be heard in the straight-to-video film Mulan II, happily admits that her heart still lies in musical theater. "I'd really love to do Elphaba in Wicked," she confides. "I know it's the kind of part where everyone who does it will be compared to Idina Menzel, the same way everyone who followed me in Saigon was probably compared to me.